Cutting Formica Sheets On A Table Saw-You must eliminate this space when you are making cuts to Formica sheets with a table saw. This is a very dangerous area if the thin edge of the plastic gets lodged in this open space, it will bind and you may damage the material. 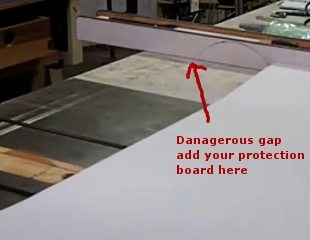 A scrap board can be placed on the table-top to reduce the risks of binding the plastic. To read an entire article on this subject go here: How To Cut Laminate Sheets On A Table Saw. You will also find a Youtube video demonstrating how easy the process really is.